After three weeks on strike, 1,400 CWA members returned to work after reaching a contract agreement with Frontier Communications that protects jobs in West Virginia and Ashburn, Va.
"I could not be more proud of our members," said Ed Mooney, Vice President of CWA District 2-13. "Going on strike is never easy. But they knew what was at stake for their co-workers and for their communities. Thanks to their strength and unity, our bargaining team has reached an agreement with Frontier that will ensure that they will continue to have good, family supporting jobs." Members will hold a vote on the proposal in the coming weeks. Read more about the agreement here. During the strike, CWA members received an outpouring of support from community members and legislators, and they were joined by hundreds of supporters at a rally in Charleston on Saturday. Frontier workers and supporters held a big rally in Charleston, W. Va., for job security at Frontier. AT&T wireless workers from nine southeastern states and the U.S. Virgin Islands voted to ratify a contract providing increased wages, more job security, and rollbacks of offshoring and outsourcing for more than 12,000 workers. Read more about the contract here. The regional director of the National Labor Relations Board has determined that the Pittsburgh Post-Gazette violated federal law by refusing to pay a 2018 increase in the health care costs of 150 members of the Newspaper Guild of Pittsburgh/CWA Local 38061 while the two parties are involved in contract negotiations. The Guild filed an Unfair Labor Practice charge against the company on Jan. 12 because, through its union-busting law firm King & Ballow of Nashville, Tenn., it refused to pay a 5 percent increase in the health care premium for 2018, thereby unilaterally cutting health care benefits. Companies involved in bargaining are required by federal law to maintain the same level of wages and benefits of expired contracts. The Guild and other unions at the PG have been involved in contract negotiations with the paper for more than a year. Its contract expired March 31, 2017. CWA members from Local 4703 in New Albany, Ind., are mobilizing for a fair contract at AT&T Midwest. 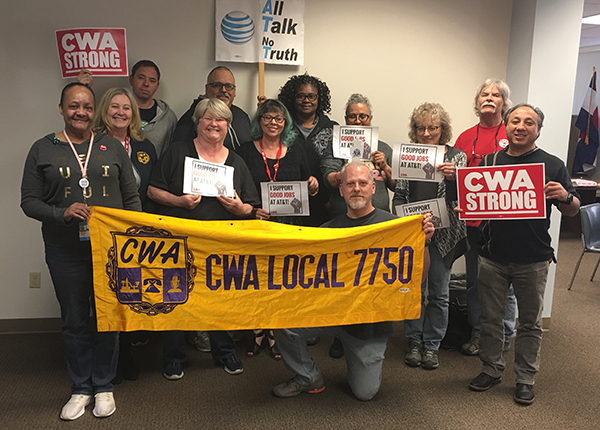 CWA members from Local 7750 in Denver, Colo., are mobilizing for a fair contract at Legacy T.